The RCSB PDB serves a wide variety of users interested in biology, including researchers, teachers, students, and the general public. To help keep our different user communities informed about RCSB PDB activities, we rely on a number of web- and email-based communication methods, including social media. 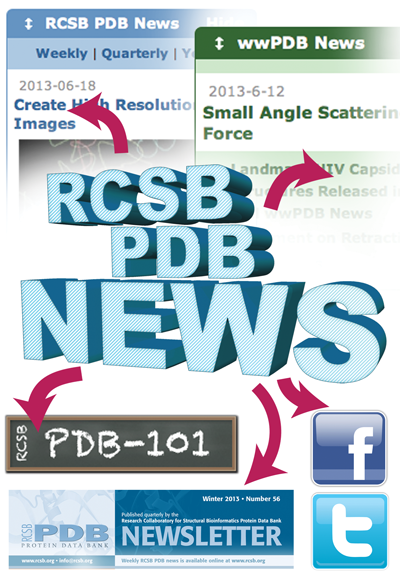 RCSB PDB weekly news is the primary source for updates and related content. Detailed announcements of meetings and events, new tools, PDB-101 features, and descriptions of how to use RCSB PDB tools and services are posted with each regular update to the home page and to pdb-l@rcsb.org. wwPDB announcements and news are published at wwpdb.org. These notices then appear on the RCSB PDB home page in the wwPDB widget. An RSS feed is also available. Educational highlights are published on the PDB-101 home page, along with the latest Molecule of the Month column. Molecule of the Month articles are also pushed via an RSS feed. These news features are all posted on Facebook and Twitter, along with links to related materials found at external sites. The quarterly newsletter combines RCSB PDB news with additional details, including deposition statistics and website usage information. In addition, the newsletter's Education Corner shows how the PDB archive and RCSB PDB resources are used in classrooms all over the world. Past topics have ranged from a crystallography program for middle school students to the educational experiences that led recent RCSB PDB Poster Prize awardees to study structural biology in graduate school. With RCSB PDB news and updates so readily available through electronic methods, we have decided to cease printing the paper edition of the quarterly newsletter. The current issue will be the last that is printed and mailed to our subscribers. ﻿The newsletter will still be published online. We encourage all of our readers to sign up for quarterly newsletter electronic updates at bit.ly/13XwVFP. 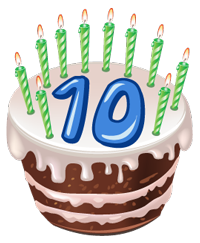 July 1, 2013 marks the 10th anniversary of the founding of the Worldwide Protein Data Bank. The wwPDB consists of organizations that act as deposition, data processing and distribution centers for PDB data: RCSB PDB (USA), PDBe (Europe) and PDBj (Japan), and BMRB (USA). The wwPDB's mission is to maintain a single PDB archive of macromolecular structural data that is freely and publicly available to the global community.